Today is the start of a new year. Doesn’t it feel good to start fresh sometimes? Never mind the fact that really nothing in life is different from yesterday… Except for the year. It feels new though… And perception is half the challenge don’t you think? With that in mind, I was bound and determined to get to the fist day of my 30 day painting challenge. We had some changes in plans due to winter weather so painting didn’t hit the radar until late in the day. So I kept it happy and simple. 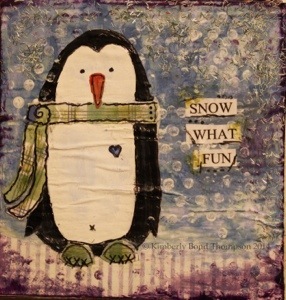 This little guy is mixed media on chipboard. It feels good to get creatively messy again! Happy 2014! May this be your best year ever!